LET’S PAINT! 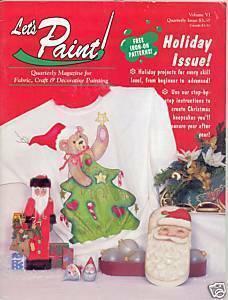 Volume VI Quarterly magazine for Fabric, Crafts Decorative Painting 1993 They call it a magazine, but there are no ads just instructions, patterns and some old call for entries in old craft shows. Magazine Description This 46 page magazine is in very good condition. There is some small shelf wear at the edges and on the spine. Holiday projects for every skill level, from beginner to advanced! Patterns still attached in center of magazine Projects: At least 24 Projects...I can’t type them all, but here are a few: Believe in Magic - painting on wood Decorative Santa Box - painting on wood Jingle Bells Wabbit - painting on fabric Multiloading Folk Art Design Noah’s - painting wood figures Home Decorating in Miniature Poinsettia Shirt Earrings Ultra Gloss for Elegant Dining - painting on ceramics glassware All books and magazines are vintage items and sold...AS IS. Although I maintain a non-smoking and pet-free home, I have no control over where these books were before they came to live with me. I attempt to represent my goods as honestly as possible, but sometimes something will get by. If you have any doubts about an item, E-MAIL ME! If I have grossly misrepresented an sale, I will make a refund. Buyer pays for return shipments.